This brick-like book has caught my eye a few times before I actually picked it up from the library shelf. Apparently, it's a popular one, because I kept finding it atop of the other books. At first I resisted. I am only mildly interested in the history of the Renaissance, and the book seemed rather boring, 'educate yourself' type anyway. Eventually I gave up, checked it out and was once again proven how misleading a first impression can be. 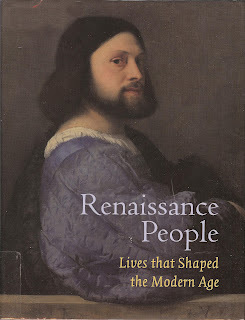 Renaissance People is NOT boring. It is well written, beautifully illustrated and, well, educational in the non-invasive, non-irritating way. It presents about a hundred of short biographies - two to three pages of text each. I was particularly impressed by the selection: apart from the obvious bunch of writers, painters and thinkers we get an acrobat, a courtesan, some actors, even a celebrity chef! Each biography presents a person from birth to death and is generously laced with anecdotes and fancy highlights throughout. Pictures take roughly as much space as text - and what pictures! Quality of my edition was breathtaking - thick, heavy, pleasant-to-touch paper, lifelike colours and impressive detail. The whole book feels like a medieval manuscript on your lap, with its weight and bulkiness. A historian would probably be bored by Renaissance People - due to the book's format, the biographies are rather sketchy - but for the rest of the world, the book is definitely worth recommending.